It's been a minute, hasn't it? What we meant to be a 1-2 month break turned into 2 years, yikes! So you might be wondering, "Why exactly has this taken so long?" I figured you might ask that, my friend. So I wrote all about it, right here. Now, I'm gonna be really real here for a second: I have to admit, I've dealt with a hefty amount of nerves getting ready to relaunch East End. As excited as I've been to get the website back out there, I've been nervous about what people might think when they see "the return". Would people be judging me for taking so long to come back? Or for the fact that the site went on such a long hiatus in the first place? And not only that... I've been afraid that I would fail. What if I come back, start again, share my heart and everything I've been working so hard on, and have felt so incredibly proud of, but nobody likes it or nobody cares? 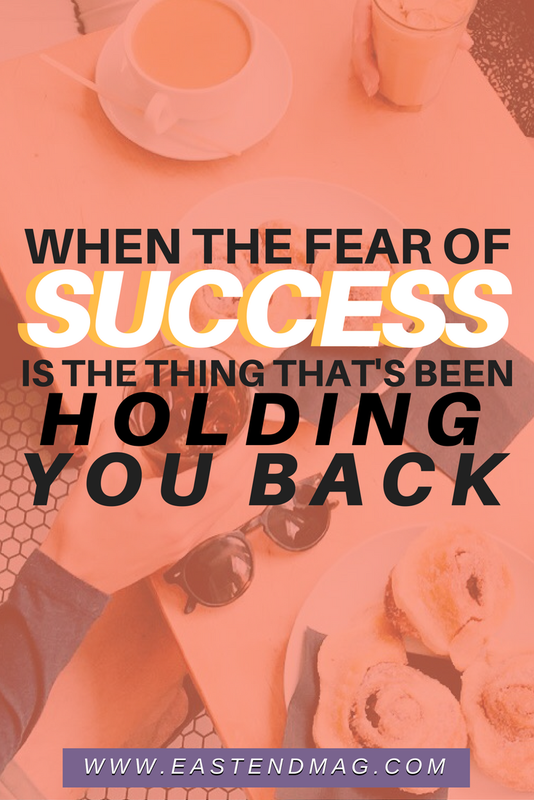 Have you ever found that you're holding yourself back not out of fear of failure, but fearing what will happen if everything you've dreamed up actually WORKS? I know that sounds insane, but if you've ever started a new project or little side hustle, I'm willing to bet you could relate. You know that saying, "Don't let the fear of striking out keep you from playing the game"? "Don't let the fear of hitting a homerun and wondering if your legs will carry you all the way around the bases after the fact keep you from playing the game." I mean, running the bases after a homer is the easiest part, right? You don't even have to be FAST, for goodness' sake! The thing is, you just have to have done the preparation before the fact to be able to hit that homer in the first place, am I right? We are totally our own worst enemies, aren't we? I mean, I've been working on this revamp for 10 months... 10 MONTHS, yes, you heard me! And my fear of whether or not I'd succeed has held me back, for sure. But the bigger the struggle for me was this: would I be able to actually HANDLE success if I got to that point? This week I decided, to say, "Screw it! I may not be fully ready. The website DEFINITELY isn't fully ready. And I may not feel like I've got enough to show for myself after all this time, but let's just DO IT." And there you have it. That's why this post is sitting here on the website on this fine Monday afternoon. Not because I think everything is perfectly ready for your eyeballs to look over. Not because I'm insanely confident in my system set-up and infrastructure. Not because I've got just OODLES of content waiting for you on the blog (nope, just the one post for now, with MANY more to come!). Want to stop making excuses + start making progress? Get the free goal strategy checklist right here! But because I decided to stop standing in my way and to quit letting my perfectionism dictate my business. I literally ended up sort of tricking myself into writing this post... I had no idea what I came here to write, and yet here we are! Cuz guess what? It will NEVER be perfect. This is a PROCESS, you guys. And today I decided that I really want to share this process and this journey with you. You guys are the ones who supported East End from the beginning, when I had (pretty literally) no idea what I was even doing. You guys are the ones who have never forgotten East End and have continued to ask me what was up with everything, and would it be coming back (you have no idea how much that meant!). You guys are my East End fam, and so I realized I just couldn't wait to welcome y'all into my new home. We'll be covering things like travel tips, city guides, entrepreneurship tips and stories, tech set-up, workflow strategy, and how to make your business sustainable even while you're on the move! Another new thing we're implementing this time around with East End is a BRAND NEW online community of entrepreneurs! Because bonding through the comments section of a blog can be difficult, I decided to take the community to where people were already hanging out, namely: Facebook. In the Facebook Group we're building a fantastic group of go-getters, dreamers, hard-workers, and passionate entrepreneurial types. We help each other out when we get stuck, offer encouragement, and are making connections like crazy! And we'd love to have you! You Can Join Right Here! If you've been working on something and you keep feeling stuck, frustrated, or like you'll never be ready, maybe you should just freakin' go ahead and DO IT. Like, I'm talking RIGHT NOW. It can have mistakes. You'll learn from them. We can learn together! You have NO idea how good it feels to just DO THE THING and GET IT OUT THERE. So! How does that sound? You wanna come over? Swap stories? Have a tasty beverage and catch up? Great. I'll be here, so come over whenever! East End is BACK (in case you couldn't tell, now that you're here)! Go look around on the site to check out the changes and a new freebie I made just for you! I've learned to stop letting perfection hold me back from releasing the things I'm passionate about... you should, too! I did the thing, now YOU GO DO THE THING (whatever thing scares you, but you know you just need to DO)! PS - Get the Free Goal Strategies Cheat Sheet Right Here! Christy is a 23 year old, newlywed, recent college grad living in Pennsylvania. On June 7, 2014, Christy married her favorite person in the whole world, Ben. Several years prior, Christy and Ben met in Australia at the ripe old age of 18, while doing a school with YWAM. Also while in Australia, she discovered her passions for community and social media communication, inspiring her to pursue a degree in this area. She graduated from Millersville University with her Bachelor’s degree in Business Communications and Public Relations in 2014. Passionate about using her love of writing in pursuit of her career, as well as building a faith-based and relational community, Christy was inspired to launch East End in the winter of 2014. You can follow her on Instagram and Twitter.